Norcia mentors serve lunch at Blanchet House in Portland. Photo courtesy of Constance Uribe. The Portland Service Immersion is an opportunity open to all students, and one of the most popular of the many chances to experience the Benedictine values taught at Saint Martin’s. This service trip can be briefly summed up by its title; ‘service immersion.’ It is a way to serve the impoverished of a community through a non-stop two-day immersion in the Old Town district of Portland. Students begin the trip by proceeding together from Saint Martin’s University to Portland’s Old Town district, arriving at Saint Andre Bessette church, a service-oriented parish where the students sleep. Sleeping on the floor of the church is the first step in the process of empathetically walking a mile in the shoes of a homeless person. 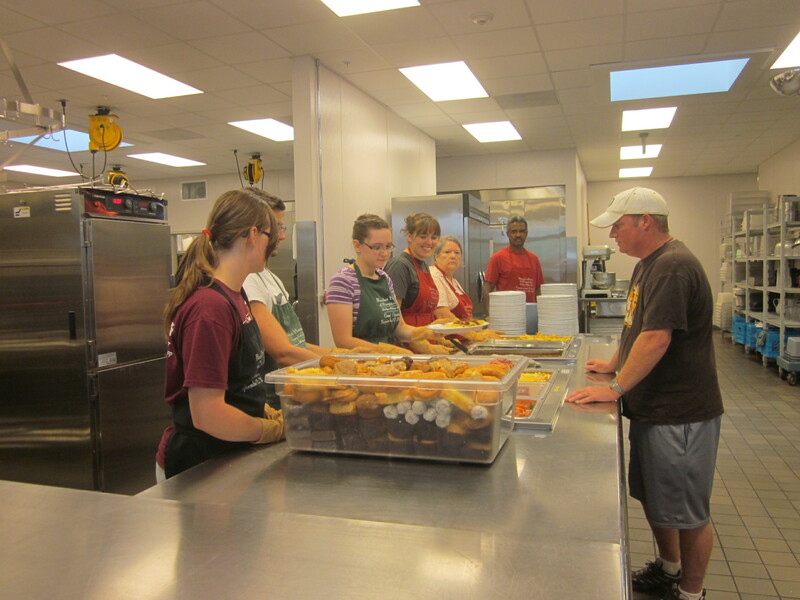 Students serve an evening meal and proceed with the two-day trip by serving meals, engaging with the homeless population, and learning about the work done by both Saint Andre Bessette Parish and the Downtown Chapel. Portland’s homeless population is a serious and a growing problem. A similar situation exists in the Puget Sound, though the number of homeless people is not as high as in Portland’s metro area. There are many explanations for this issue; ranging from the systemic, large-scale, explanations such as social-justice issues not being an economic or legislative priority in our society, to more simple explanations like accepting that no matter anyone does what injustice exists. The trip’s organizer, Susan Leyster, Director of Service Immersion Programs, explained how this opportunity to serve goes beyond the academic, policy-oriented, and theoretical experience of the homelessness issue. This trip is a chance to “put a face to poverty” and make contact with this underrepresented part of our society. Thanks to the trips’ past successes, the September and November applications are full. However, the December Portland Service Immersion does have some spots available. Students are encouraged to contact Susan Leyster (LEYSTERS@stmartin.edu) for more information, or to be placed on a waitlist, in the event that there could be last minute drops from the November service trip. The December trip will take place on Dec. 6 and 7. Spots are going quickly, so move fast if this opportunity sounds like one you can’t miss.